We’re halfway through our 12 Days of Small Businesses countdown, and today we’ve got six dentists who love clean website designs almost as much as clean teeth. 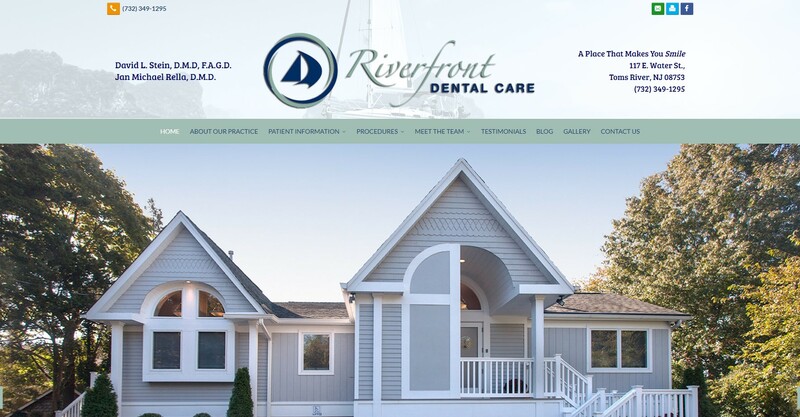 As their name states, Riverfront Dental Care is located next to a park and overlooks the Toms River. David L. Stein DMD and Jan M. Rella DMD have both been featured in the NJ Monthly Magazine for Top Dentists in 2015 and 2016. Riverfront Dental Care recently welcomed Dr. Sinikka Kazanjian to their staff. Dr. Henson attended the University of South Carolina from 1984 to 1988, where she received her bachelor’s degree in psychology. She then attended the University of Louisville for dentistry from 1991 to 1995. For over 20 years, Dr. Henson has been passionate about providing superior care for her dental patients and specializes in preventive cleaning, cosmetic dentistry and restorations. In her spare time, Dr. Henson enjoys horseback riding and the company of her friends and family. 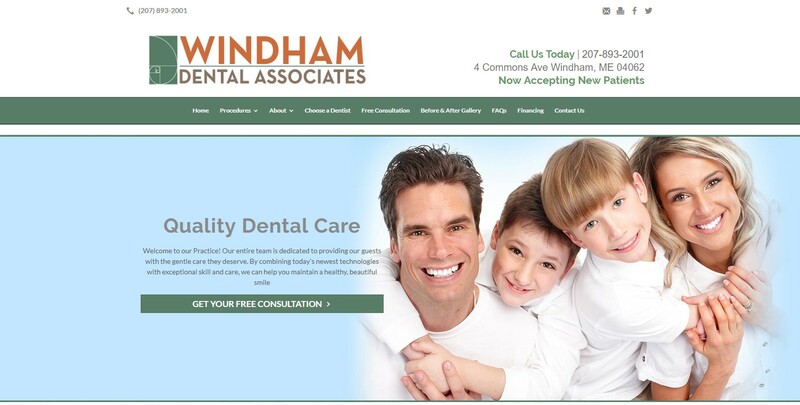 Dr. Michael Bufo, Dr. Alex Kerbaugh and Dr. Jordan Hicks make up the Windham Dental Associates team in Windham, ME. Dr. Bufo averages almost 100 hours of continuing education per year and was chosen to be a clinical instructor at the renowned Las Vegas Institute for Advanced Dental Studies (LVI). He travels to the Institute several times each year to teach dentists from across the globe about the most advanced cosmetic dentistry procedures and therapy for TMJ disorders. He is a member of the American Dental Association, the Maine Dental Association, the International Association of Physiologic Aesthetics and the International College of Craniomandibular Orthopedics. Dr. Michael Bufo, Dr. Michelle Beaulieu and Dr. Alex Kerbaugh are part of Brighton Dental Associates, Windham’s sister office, in Portland, ME. From 1987 to 1990, Dr. Bufo served as a captain in the United States Air Force, providing dental care for retired and active duty service members and their families. Dr. Melnyk has been practicing since 1983, first as a general dentist in Minneapolis, Minnesota while in graduate school, and then as a periodontal associate in the Syracuse area from 1985 to 1988. In 2006, Dr. Melnyk was presented the Drs. McMahon-Roy Award for Outstanding Service to the Dental Profession by the Fifth District Dental Society, State of New York, for his role in bringing the S.U.N.Y-Canton Dental Hygiene Program to Rome, New York. He is an avid fisherman and skier, and his interests include books, travel, tropical fish, computers and nature photography. 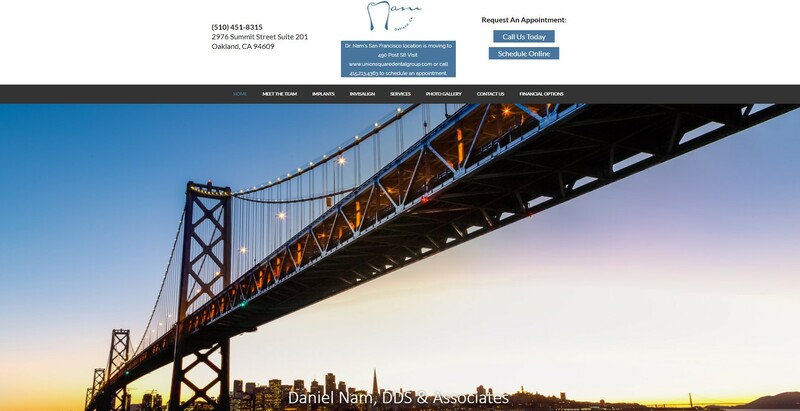 Dr. Daniel Nam graduated from UCLA with a BA in piano performance in 1996 and then UOP School of Dentistry in 2002. Dr. Nam is an avid musician and singer. He loves to golf and travel and appreciates the many incredible restaurants in the Bay Area. We’ve got more small businesses coming your way, so stay tuned for Five Ho-Ho-Home Inspectors tomorrow.